Submitted on 2014-02-18 23h14 by matthiaskrgr, last changed by Christoph. 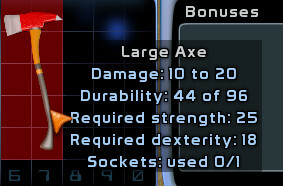 hover axe=> "Large Axe" now printed in grey instead of blue. item has at least 1 socket. Else it default to the "neon" font. color (blue is gray and neon is blue). // If the item has upgrade sockets, use a different color for the name. Hmm. Well I still don't think it makes a lot of sense to have it colored specially. enhancements with blue like the items appear in the inventory.